Cocaine with an estimated value of €32.4 million was found hidden inside four containers at the Malta Freeport, Customs announced on Tuesday evening. The drug haul was made after Customs officials scanned 12 containers coming from a country in South America and bound for an unnamed EU member state. Four of the containers, which were loaded with fruit, were flagged during scans. In three of them, packets were spotted in refrigerant compressor compartments. In the other, suspicious packages were noted hidden behind the panelling of an inner compartment. Physical searches of the four containers revealed their true contents. The containers were carrying 96kg, 82.8kg, 64.8kg and 44.4kg of cocaine respectively. In total, Customs officials found 240 packets of the drug weighing a total of 288kg. 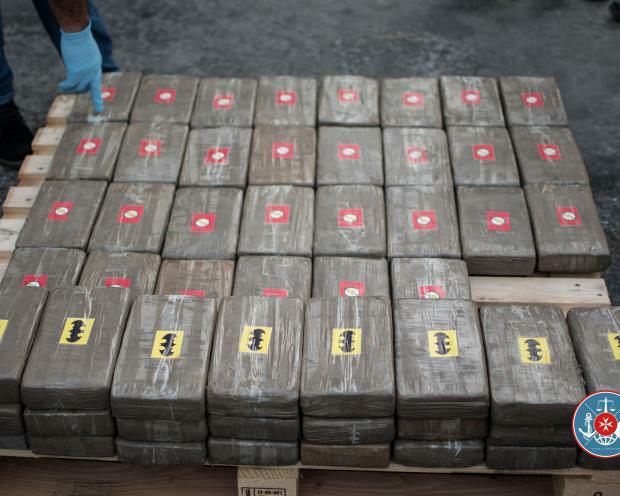 This was the second largest cocaine haul ever by the customs at the Freeport. It did not seem any Maltese were involved. Addressing a news conference on Wednesday, Customs director general Joseph Chetcuti said a new specialised unit at the Freeport which started operations in January last year. In the past 15 months this led to the discovery of 16 tonnes of cannabis and 633 kilograms of cocaine. Finance Minister Edward Scicluna hailed the haul as a very good certificate for the Maltese authorities in the fight against organised crime and drug trafficking. Tourism Minister Konrad Mizzi, who is also responsible for the Freeport, noted that similar equipment would soon be installed at the Malta International Airport. The case is now the subject of a police anti drug squad investigation. An inquiry is also being held. In February of 2018, 100kg of cocaine were detected in a container at the Freeport and sent under controlled delivery to Croatia, where a huge criminal gang was arrested. In November, 44kg of pure cocaine was found in a container reefer arriving from Equador. Another €5 million worth of cocaine was found in container headed to Greece in December.